This is the place for history in sight and sound. You'll find some of the earliest and historically significant audio and video files here. All of the audio and video recordings throughout this site are available in Windows Media format. A broadband connection is recommended. Historical Audio and Video has seldom heard recordings including Orson Welles meeting H.G. Wells and Babe Ruth at Yankee Stadium a little more than a year before his death. If you are interested in the Hindenburg dirigible, this is the place. Listen to Herb Morrison's broadcast of the Hindenburg crash and watch a short video of the explosion and crash. There are also Public Service Announcements instructing Americans on war-time activities and much, much more. You can even watch one of Dwight Eisenhower's presidential television commercials. Check it out! Old Time Radio includes information and sound clips from various Old Time Radio programs, including Suspense, The Lone Ranger, The Shadow, The Fat Man, Inner Sanctum, The Whistler, I Was a Communist for the F.B.I., and Yours Truly Johnny Dollar. Get an inside look at how a radio show was made by watching a short film called Back of the Mike. This video shows how some sound effects of Old Time Radio shows were created by taking you into the radio studio. To see what a typical broadcasting day was like in 1939, check out radio station WJSV's schedule on September 21, 1939. A sampling of various audio clips of the day's recording is available. For those interested in World War II, a brief history of the war, many audio clips of speeches, informational films, and motivational posters can be found on the WW2 History page. Speeches made by Winston Churchill, Franklin D. Roosevelt (Eleanor Roosevelt also made a radio address), Dwight D. Eisenhower, Neville Chamberlain, Harry Truman, Douglas MacArthur aboard the U.S.S. Missouri in Tokyo Bay are featured as are news accounts and a newsreel showing the destruction at Pearl Harbor. 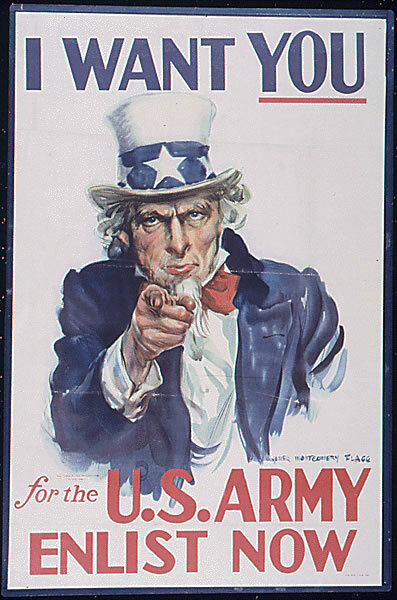 The Propaganda Posters page has many U.S. Government posters designed to motivate Americans in the fight against tyranny. Many of the posters are from War Bond drives encouraging conservation and for Americans to save money to help finance America's war effort. The WW2 War Loans page has movies used in the War Bond campaigns to help finance the war and the WW2 Home Front page has videos of America coping with the war mobilization. The battle for Iwo Jima is outlined and includes a 20-minute color documentary. Photographs of the planes to deliver the atomic bombs to Japan and facts about the deployment can be found on the atomic bomb page. The Television Web page includes a brief history of TV "firsts" and a 20-minute film about TV. The Cold War page consists mainly of movies promoting democracy and surviving an atomic explosion. Hear Winston Churchill describe the Soviet Union and the "iron curtain". Watch all nine minutes of the Civil Defense film Duck and Cover, starring Bert the Turtle, and other educational movies. Listen to Adlai Stevenson, at the United Nations, confronting the Soviet ambassador during the 1962 Cuban Missile Crisis. Audio clips from a couple of John F. Kennedy's famous speeches, President Ronald Reagan's 1983 "Evil Empire" and a clip of his 1989 "tear down this wall" speeches, are available. Please note: The audio and video on this site require Windows Media Player. Please disable your browser's popup blocker to allow the player to launch in a new window.